I have made a ton of zines over the years, here are the time frames, covers and soon, more details on each issue I have put out. If you'd like more info on a particular issue, get in touch! 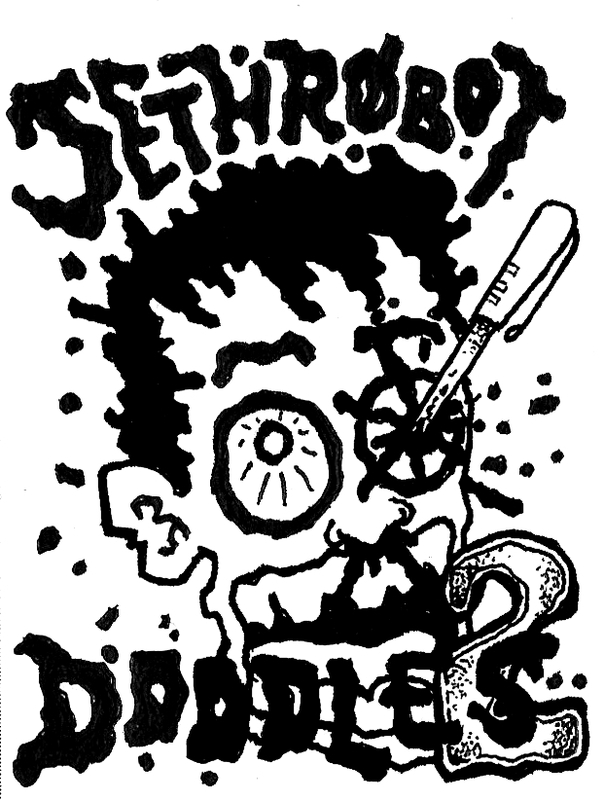 This was my first real zine, I had made a few attempts prior to this after picking up MRR and seeing that anyone could make a zine. When I moved from California to Pittsburgh Pennsylvania, it seemed like a natural fit to fall into the punk scene and interview all the great local bands. I made a lot of friends and great memories. And a punk rock crossword puzzle! 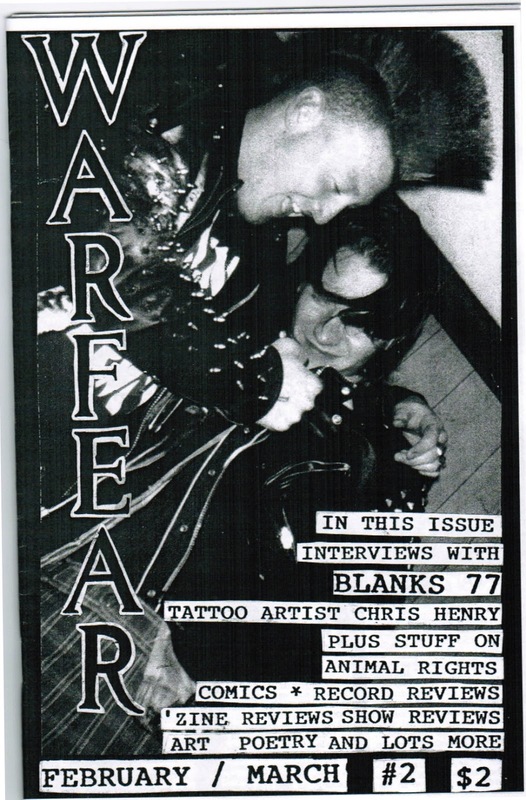 The first two issues of Warfear got me the a spotlight in MRR as "Zine of the month." 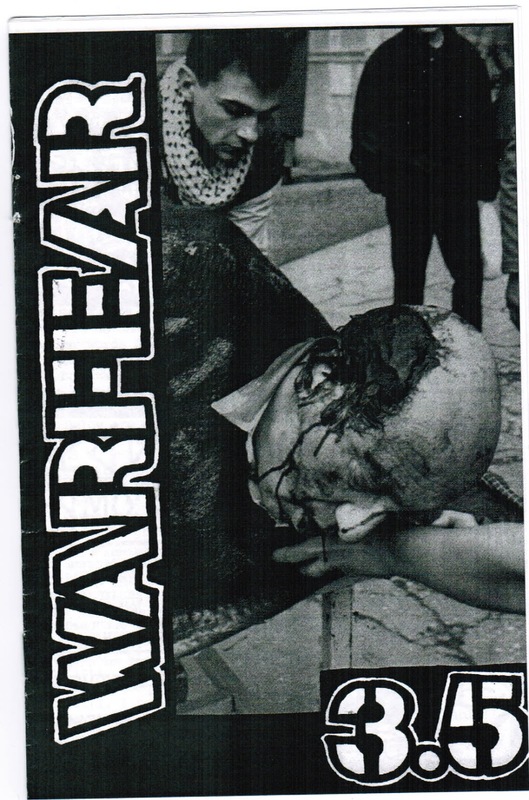 Two issues into my first zine, this was a pretty major event. 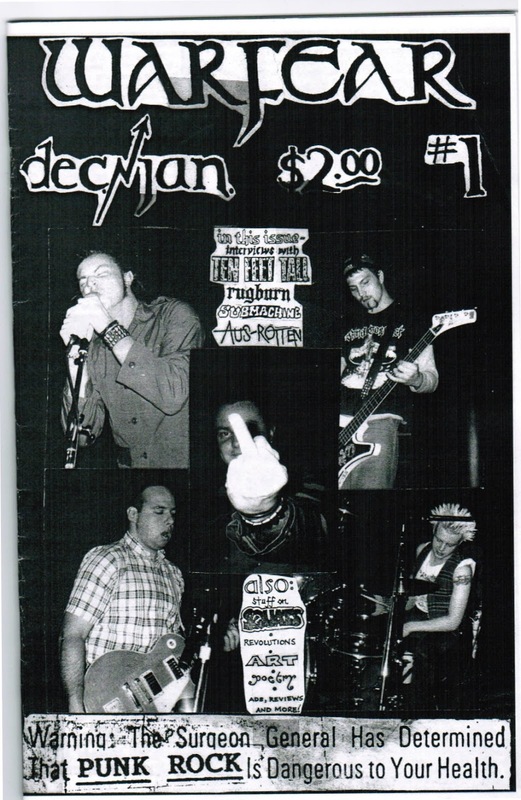 Still one of my favorite covers with Alex and Doug from Submachine. 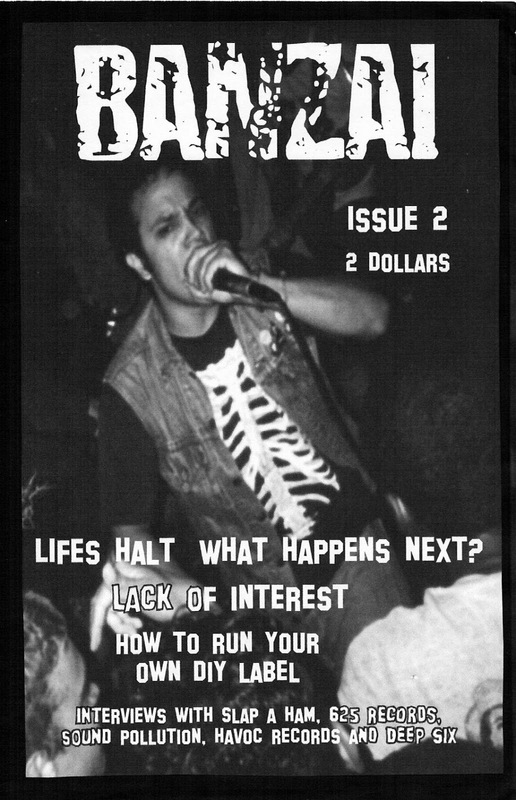 As I struggled to put out issue #4, I did a half issue to hand out for free at local shows. 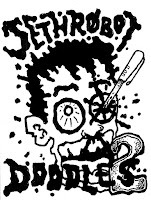 I had just moved closer to Pittsburgh from Indiana, PA but life was tough, money was tight and zines were hard to make. 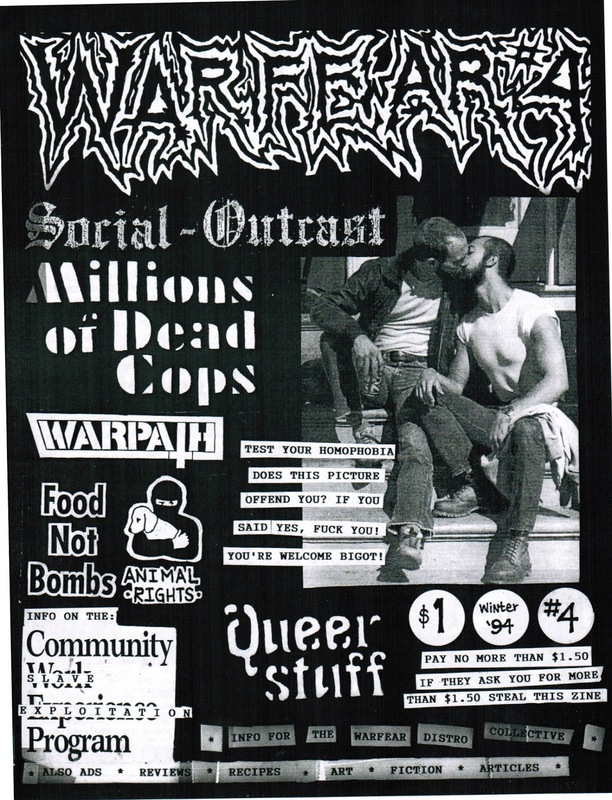 Stuff about Nazi's in Pittsburgh, Riot Grrrls, Queer Issues and some filler. Cover - I have no idea, probably from a magazine lying around. Went from half size to full size, which was a HUGE mistake. Never again. 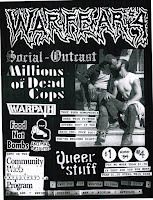 Interviews with Social Outcast, MDC, Warpath, Food Not Bombs, rants against forced labor, queer stuff and general angst. Still at full size and life was at it's most chaotic. Moving back to California from Pennsylvania right as this issue was coming together. Hence the Warfear is dead tag. 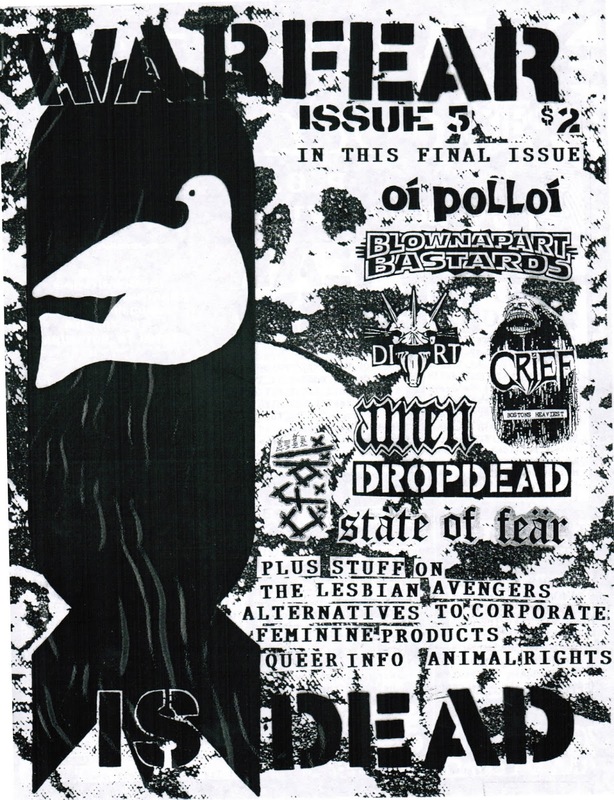 Interviews with Oi Polloi, Blown Apart Bastards, DIRT, Grief, Amen, Dropdead, CFDL, and State of Fear and a lot of other stuff. Went out with a bang. 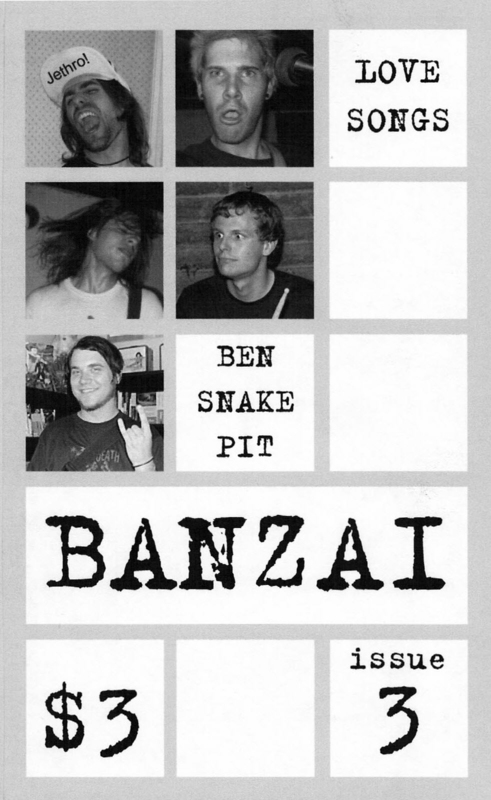 After many failed attempts at a zine after Warfear, I finally got it together and made Banzai. Interviews with Spazz, bis and Jim Mahfood. 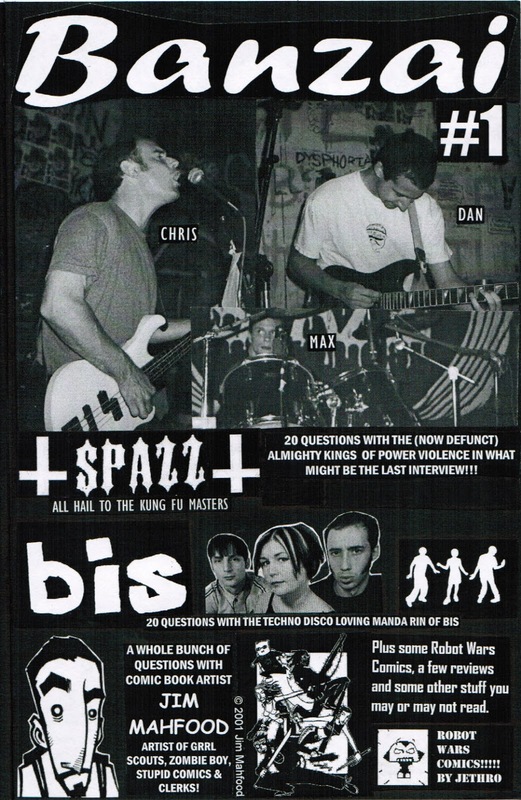 I tried to branch out of the "just punk" mode of my prior zines/attempts and went after whatever music I really liked at the time, regardless of genre, hence the bis interview. Good start for this short lived zine. This issue was a disaster from start to finish. I started it in the fall of 2001. Life hit me in the balls, and spiraled from there. In 2002, I quit my job, moved to Oklahoma, found out all the files for the zine had been deleted from my PC.....so it sat, for a long time. I eventually moved bak to California in 2003. 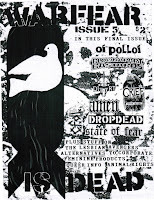 In 2004 I bought a new PC, found some old disks that had pieces of the zine still intact and with a little help from a computer knowledgeable friend, issue #2 was a reality. 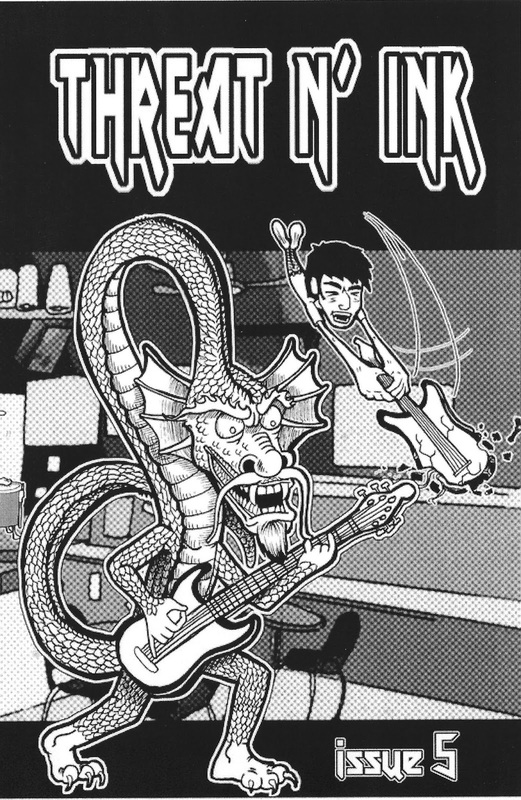 Interviews with Lifes Halt, What Happens Next?, lack of Interest, Slap A Ham, 625 records, Sound Pollution, Havoc records and Deep Six. A great issue that never really had a chance. This is not the original issue #3, that was lost in the computer debacle above. But, I came back to the idea of interviewing bands/folks I like rather than what was in, or punk. So, Interviews with Love Songs and Ben Snakepit! 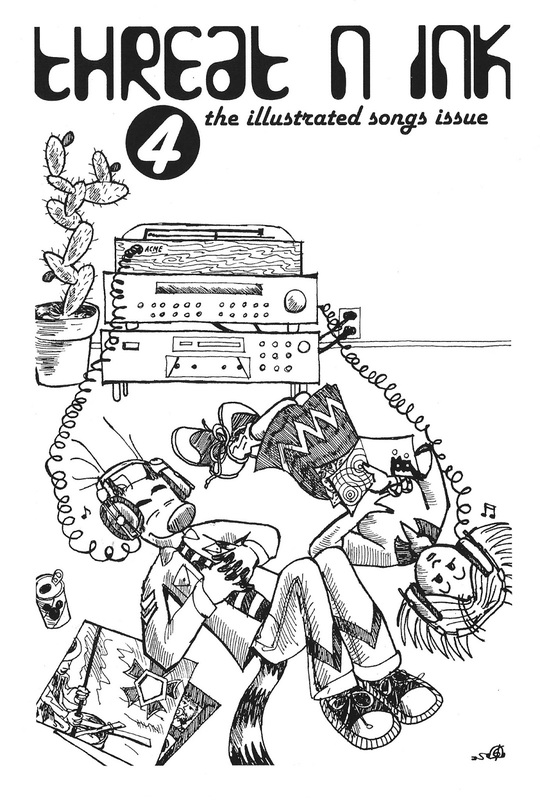 Who weirdly hooked up on tour together after this zine came out, so it was kinda like fate. There's a lot of good in this issue. 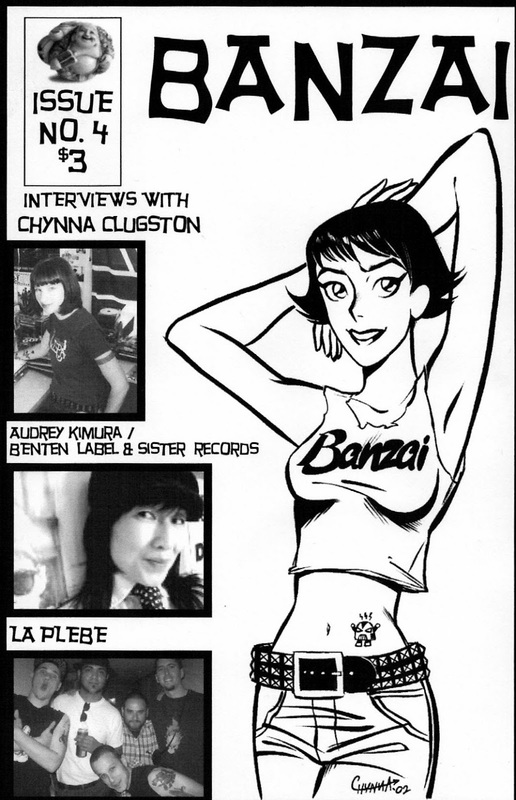 Branching out even further from a normal punk zine, I interviewed Chynna Clugston (who was in the original #3 which was lost) Audrey Kimura from Benten Label & Sister records and La Plebe who played a show on my birthday with Love Songs and were rocking the awesome. 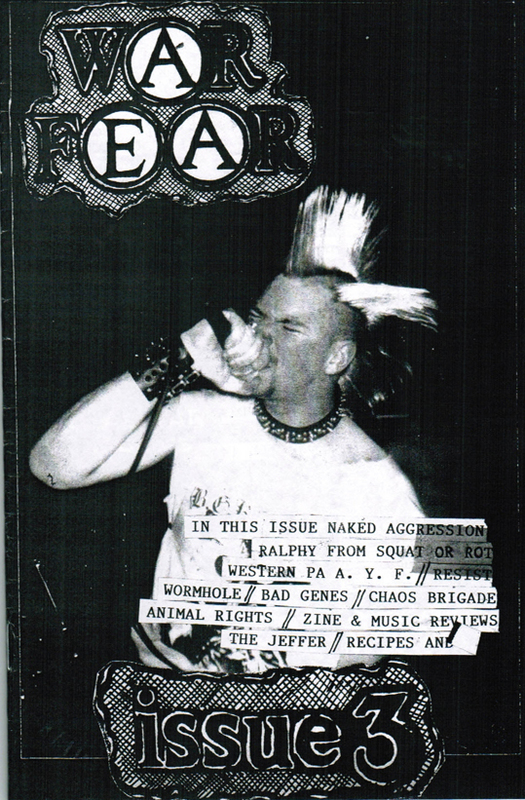 Sadly this zine abruptly ended here, there was an issue #5 in the works which had interviews with Kenji from Razors Edge and JellyRoll RockHeads and Joe Jack Talcum from The Dead Milkmen. I suffered a mental breakdown and depression and so it got shelved. Sad. Depression is a weird thing. I was working at a job ( I still work there but under better circumstances) and had an AWFUL boss. It was daily torture. But I met a guy named Juan and told him I wanted to try to do zines again but this time focus on art and comics, something I had always wanted to do. I asked him to draw me a comic, which he did. The Immortal Fluff Skuzz. I took that comic and knew I had to put out this zine. 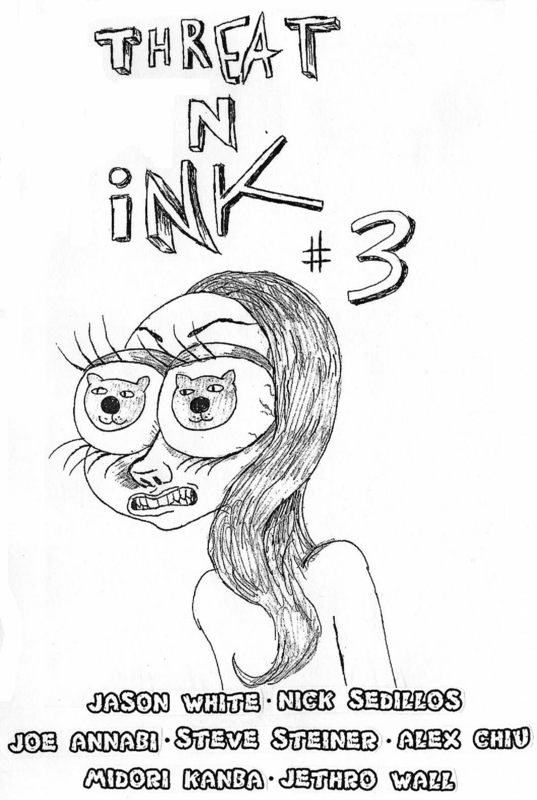 Using a name I had come up with for a potential zine in OK, Threat N Ink was born. 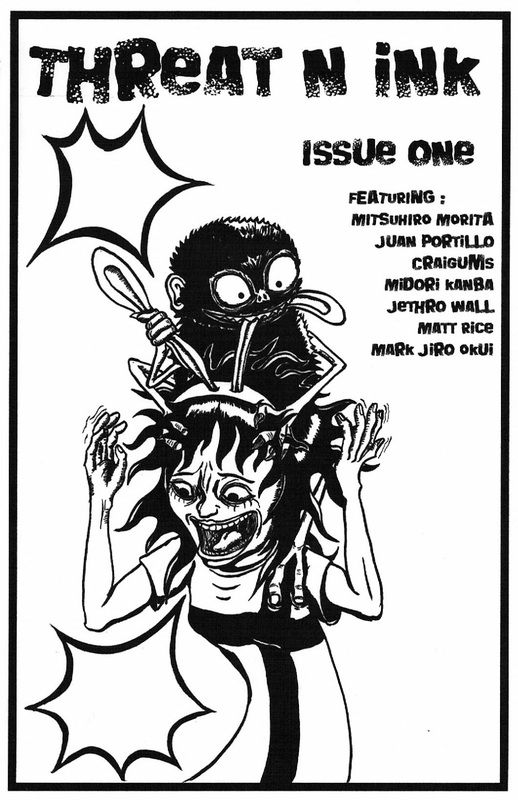 Artists in this issue included Mitsuhiro Mortia, Juan Portillo, Craigums, Midori Kanba, Jethro D. Wall, Matt rice, and Mark Jiro Okui. I was on a roll! 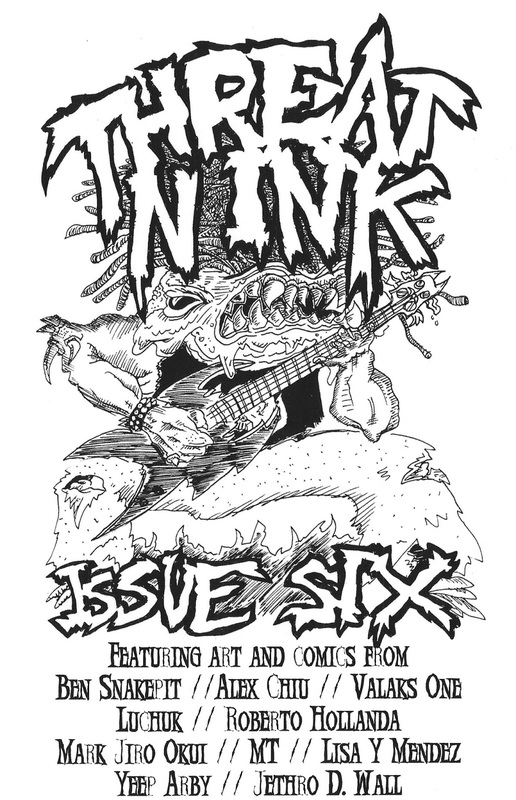 the First Issue of Threat N Ink had brought me back from the dead. I felt alive, it was fun to put this zine together, I was loving all awesome art and comics. 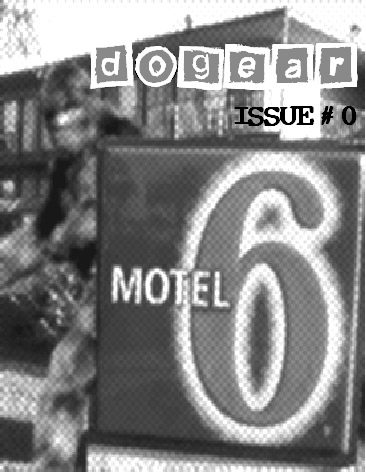 this issue featured art from Jason White, Ben Snakepit, Mark Jiro Okui, Juan Portillo, Midori Kanba, Nick Sedillos and Jethro D. Wall. This issue also included an interview with Jason White. Another great issue, but I was having another fight with depression, struggling to get artists for the zine and it was becoming longer and longer between issues. So this was almost the last issue of Threat N Ink. Solid art from all who contributed, Adam Pasion, Adrein Sanborn, Mikke McGregor & Ali Thompson, Russell Walton, Carrie McNinch, Josh Blair and Ray N., Roberto Hollanda, Jethro Wall & Tim Massmovement and Alex Chiu. Wraparound cover by Adam Pasion. I am a lifelong doodler. I doodle all the time. 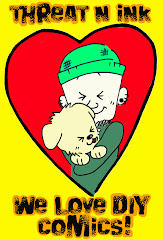 I doodled in school, I doodle at work, at the laundromat, while waiting in the car, ....you get the picture. In 1998, I was working at Art Supply Warehouse in Westminster, CA. It's still there, you can go check it out and buy some art supplies! I was in a meeting with other managers, our boss (who I notoriously got into arguments with about why we should focus on art supplies and not toys, hipster gimmicks and other non art items in the store.) was yelling as usual, and to avoid fighting with him, I was doodling. In that meeting Robot Wars (and eventually Banzai Robot Wars) was born. 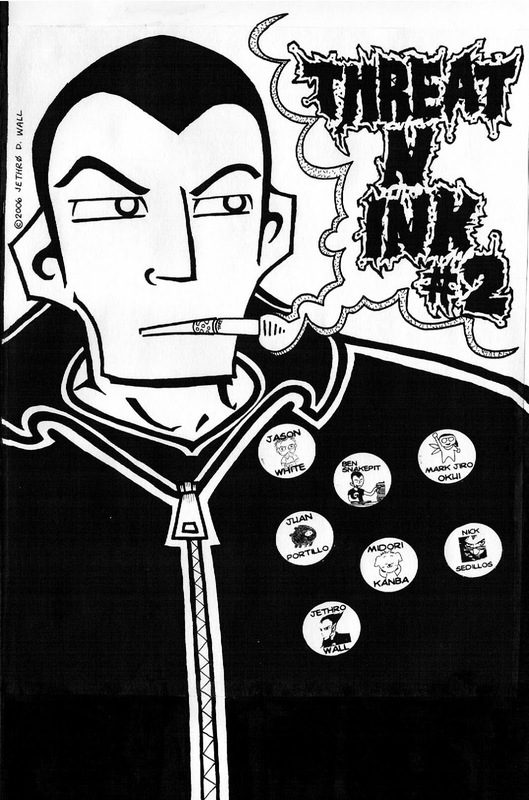 I made the first issue right around the same time I was making the first issue of Banzai. 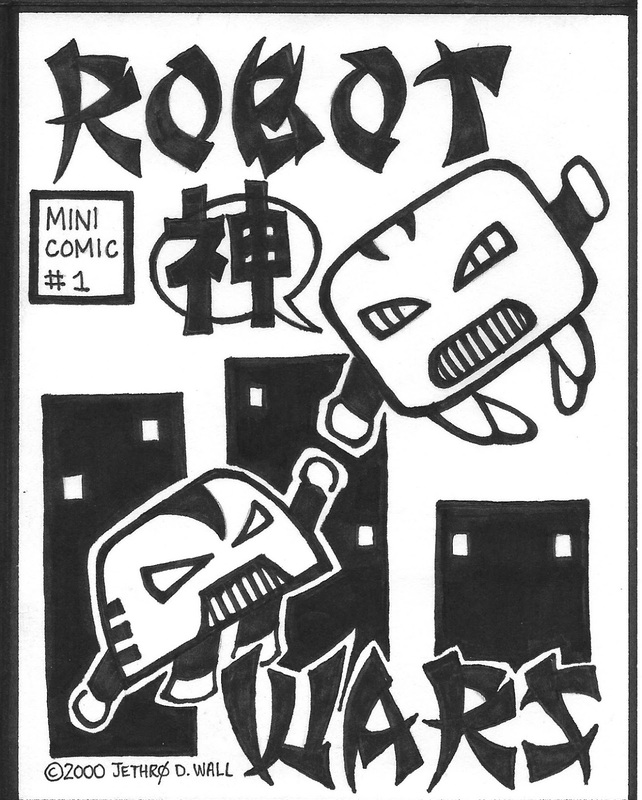 After much doodling and drawing of these robots, the first issue was born in 2001. From 2001 - to the present, I made a ton of minis. But never made a second issue of the comic. In 2007-8 (?) I discovered a great website called We Make Zines. 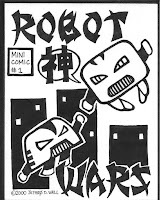 I made a group on the site that focused on Mini Zines. 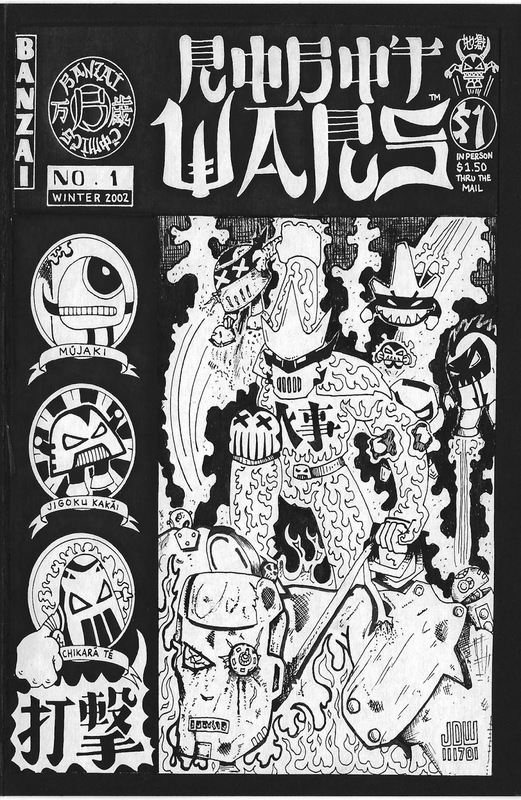 We would would do trades occasionally and one of those trades produced the zine Dogear #0. Dogear was a collection of supernatural stories from my childhood, including seeing a UFO, running into Bigfoot, a Missing time incident as a teen and a possessed Doll. All true. I have tried (unsuccessfully) to build on this issue, as I have so many stories to tell from my childhood. Lets hope that I can make that a reality. 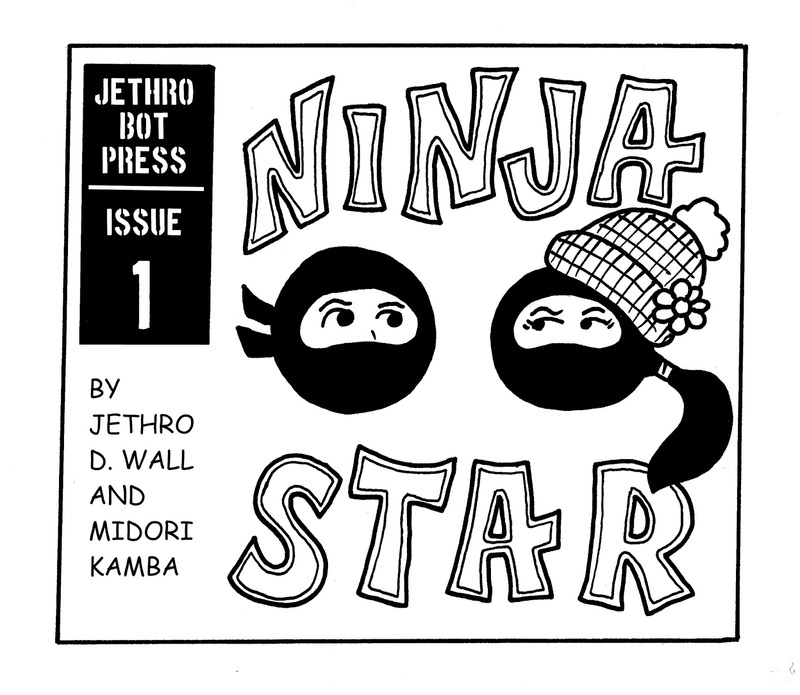 Another mini zine made for a Mini Zine Swap, was Ninja Stars #1. A comic about two ninjas, bumbling Jin and the amazing Robin. 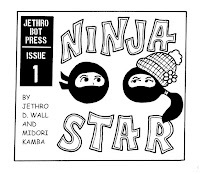 Based loosely on myself and my wife Midori, this mini comic had two short comics I drew. I have probably a dozen other strips written and laid out, I just never drew them. 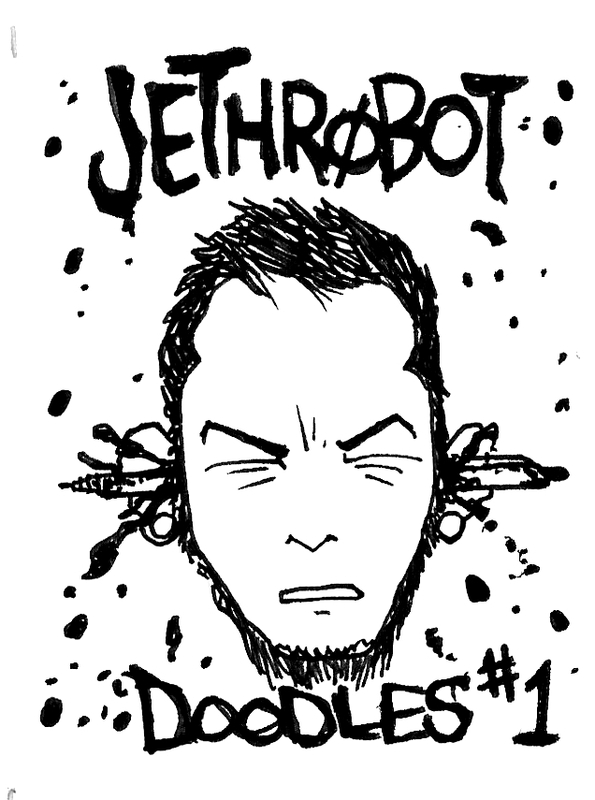 While making other zines recently, I thought it would be cool to collect my daily doodles into a micro zine, and so far two issues of Jethrobot Doodles have come out. 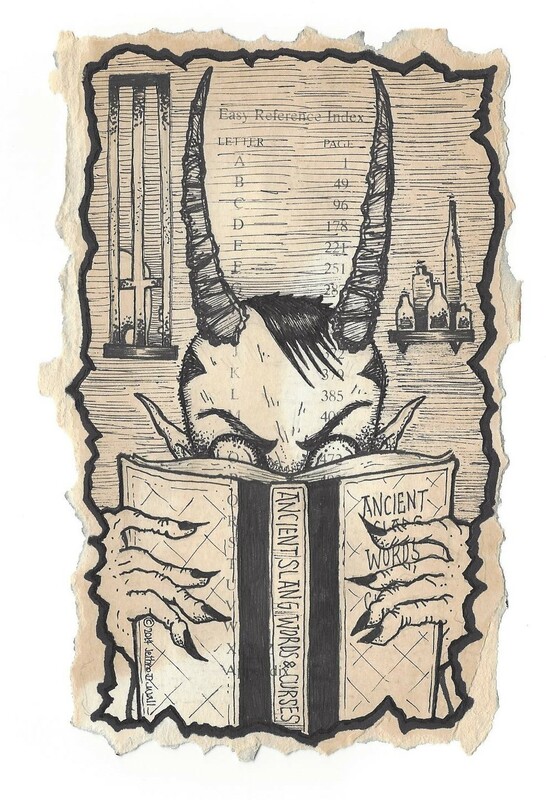 I like Micro Zines, I should make some more. Whaddaya think?